New Delhi, November 12, 2010: Sunflag Iron & Steel Co. Ltd., manufacturers of world class automobile Spring Steel. announced their partnership with Japan’s leading specialty steel producer Daido Steel Co. Ltd for technical assistance regarding equipment investment and product evaluation with Daido Steel Co. Ltd. The partnership will enable Sunflag Iron & Steel Co. Ltd. to produce high quality specialty steel more efficiently by receiving technical assistance from advance steel manufacturer Daido Steel Co. Ltd. Alloy and special steel market are one of the fastest growing markets in India steered by the accelerated growth in automobile and motorcycle industry. A huge expansion supported by large investments in infrastructure industry has also raised the demand for such steels. Eyeing the soaring consumer’s demand, most of the automobile companies are setting-up their manufacturing units in India. These companies have always generated demand for premium quality steel to produce world class automobile. In current scenario these companies have to import steel for critical components due to their non-availability in India. 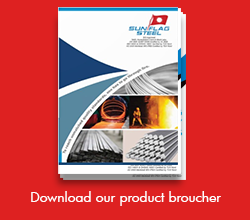 Looking at highly cost competitive Indian market importing such steel will be uneconomical, therefore, these companies are anticipating the Indian steel manufacturers to supply quality steel for critical components.